The following obituary was taken from the front page of the Hinton Daily News, dated Thursday, June 15, 1967. Funeral services will be held at 2:00 p.m. Friday at the Ronald Meadows Funeral Parlor for Miss Mary Elizabeth Gwinn, 83 of Meadow Creek, who died at 11:20 a.m. Wednesday in Ronceverte hospital after a short illness. The service will be in charge of the Rev. W. R. McCoy and burial will follow in the Meadow Creek cemetery. The body will remain at the funeral parlor where friends may call after 3:00 p.m. today. She was born at Meadow Creek Feburaury 14, 1884, a daughter of the late Lewis and Elizabeth Kaylor Gwinn and was a life long resident of the county. She was a member of the Meadow Creek Baptist Church. Her only survivor is a niece, Mrs. E. B. Fox, of Hinton. 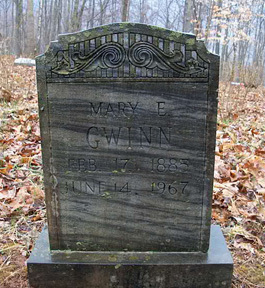 She was an aunt of the late C. N. Gwinn , of Hinton.